If you are an aqua- buff who wouldn’t miss a chance to dive into water, Kihaad Maldives, a luxury resort in Baa Atoll has devised the perfect gift for you. Say hello to Penguin: the brands compact semi-submarine that takes you into the underwater world with a level of unimaginable safety and comfort. It is also the world’s first such submarine to be introduced in the Maldives resort. While water sports like scuba diving and snorkeling promise you a good view of the aquatic life, they come with their own set of challenges. This is where crafts such as the Penguin come in. The unique vehicle almost resembles a regular boat and is made up of two floating hulls on either side of a plexi-glassed cabin, attached underneath. With the help of this central cabin that comes with three large windows on the front and the side, one can explore the ocean floor without the hassles of getting wet. Further, while sports like scuba diving require expensive certification and training, sailing the waters in the Penguin is seamless and relatively cheaper. The latest version of the semi-submarine: The Penguin 2.0 comes is dual types – electric and outboard. The main difference between the two lies in their propulsion types, with the former making use of an electric motor and the latter using a gasoline powered engine. This unique water vehicle can seat anywhere between 4 to 12 people in total, depending on its version. Here’s another incentive to plan a trip to the Maldives! 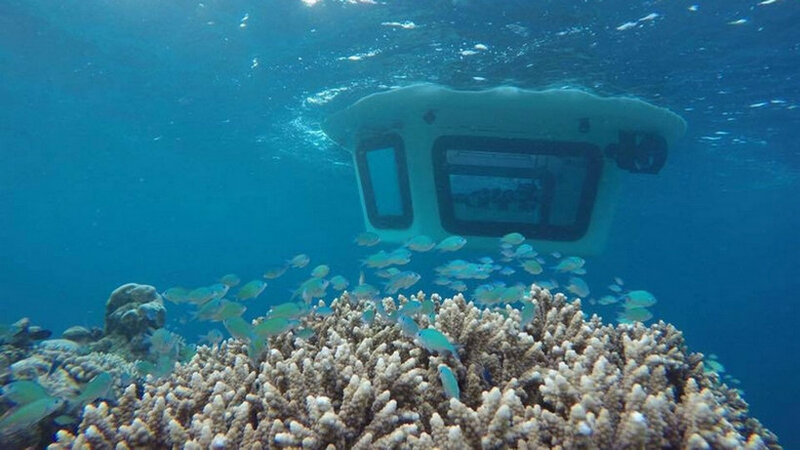 This mini semi-submarine is the hottest excursion in Maldives. The atoll area, a ring-shaped coral reef is the best place for Penguin Saling because of the rich underwater shows and calm waves. Developed by Gocean, Penguin is the first compact semi submarine motor boat. Penguin is sailing in the Maldives, Seychelles and Chengdu in China and aimed at becoming must-ride excursion all around the world’s premier resorts. This submersibles vessels is capable of diving, similarly to submarines. However, unlike submarines, they cannot be entirely submerged below the surface of the water. Penguin helps anyone to explore undersea easily and conveniently without having to swim. There are not complicated control or operation. You can enjoy fantastical view under the sea comfortably with the loved-ones. Along with exploration under the sea, you can also enjoy leisure activities on boat such as fishing, snorkeling, scuba diving or sunbathing. Penguin does not discharge pollutant and damage nature. The watercraft uses electric motor and contributes to sustainable tourism. The windows are made with acrylic material, the best for underwater viewing. Used in producing aquarium for its high transparency (92% light transmission), acrylic has a UV protection function. As time goes it does not have yellowing effect which changes the color of the material. Semi-submarines do not have an international classified status. Their operating range from the native port might be limited by the local authorities. Dimension : 3950 x 3650 x 2545 mm; Light weight : 4300 kg; Boarding person : 9~12 person (4 for cabin); Draft : 1210mm; Voltage : 48V; Running time : 8 hours running / 10 hours charging. Have you ever wondered about what goes on underwater? There are so many cool and interesting creatures down there that you may have never seen before. Unfortunately, your only realistic options are to: scuba dive, which is quite expensive for a one-time experience, or snorkel just the surface. With this PENGUIN personal semi-submarine, you can explore the underwater world whenever you want! The PENGUIN is a compact semi-submarine that resembles a regular boat with the included feature of a plexiglass-windowed cabin attached underneath to allow people to view underwater. The PENGUIN is easy to operate and can even be operated in the cabin! Allowing you to move around under the water. With the PENGUIN, you’re able to get amazing views of the underwater world. And it’s even eco-friendly with it’s different model types. The newest model of the PENGUIN is the PENGUIN 2.0. It comes in two different types: electric and outboard. The main difference of the two are the propulsion types. The electric, unsurprisingly, uses an electric motor to run the boat, while the outboard uses an engine that is powered by gasoline. Both types seat up to 12 people on board. Additionally, you can also opt out from the PENGUIN 2.0 and go with the PENGUIN 1.0. The PENGUIN 1.0 also uses an electric motor to run the boat, but can only seat up to 4 people on board. If you’d like to get a PENGUIN, you can contact the company here to get a quote. Ever wanted to see the amazing sights of the coral reefs beneath the surface of the Indian Ocean? Don’t want to get wet? Hideaway Beach Resort & Spa has introduced an amazing underwater experience aboard the ‘Penguin’, extending the resort’s selection of exciting excursions. The first of it’s kind in the Maldives, the semi-submarine called ‘Penguin’ gives guests the opportunity to explore the resort’s unique reef system. From dolphins and stingrays to reef sharks and sea turtles, guests will be able to discover the tropical sea life during this underwater adventure of a lifetime. Ideal for guests who are keen to stay dry, the Penguin is designed to transport passengers into the underwater world in safety and comfort. The mechanism is made up of two floating hulls on either side of a central cabin with a compact transparent compartment that hangs from the middle and stays below the surface of the water, offering an immersive undersea experience. The state-of-the-art vehicle seats 6-8 people – ideal for both families and couples wanting to spend quality time together in a small, private group. 현대자동차 오토캠핑 서킷 페스티벌에 참여하다!! (주)POL, (주)EPG, 전라남도 영암에서 개최된 현대 자동차 보유 고객을 대상으로한 [제11회 현대자동차 오토갬핑 서킷 페스티벌] 에 참여. 현대자동차 오토캠핑은 최근 자동차 레저 문화의 트랜드로 자리잡고 있는 오토캠핑을 통해 고객들에게 즐겁고 색다른 경험을 제공하고자 2009년부터 꾸준히 진행된 고객초청행사다. 올해는 실제 레이싱 대회에 사용되는 서킷을 경험할 수 있는 전라남도 영암 코리아 인터내셔널 서킷(KIC) 내 캠핑장에 고객 총 150 가족을 초대해 10월 24~25일, 1박 2일 일정으로 개최되었다. 현대차는 캠핑 장비가 없는 100 가족에게는 캠핑 용품 및 장소를 무상으로 대여하고 캠핑 장비 보유 50 가족에게는 캠핑장을 무상으로 제공하였으며, 현장에서는 가족들이 함께 즐길 수 있는 레이레이션 체험존, 올림푸스 포토존과 같은 체험행사와 투싼, 싼타페, 맥스크루즈 등 현대자동차 SUV 차량도 전시했다. 최근 새로운 아웃도어 레저 트랜드인 자전거, 캠핑, 해양레저 스포츠를 겨냥하여 현대자동차 SUV 차량과 포인트 65의 모듈러 카약을 함께 전시함으로써 고객의 삶 속에서 다양한 즐거움과 경험을 제공하고자 하였다. 모듈형(분리형) 스웨덴 포인트65 카약은 기존의 무겁고 일체혐이어서 이동이 불편했던 고형 카약의 단점을 개선하여 무게가 가볍고 분리가 가능하여 SUV 차량의 트렁크에도 들어가는 이동의 간편성을 인정받아서 페스티벌에 같이 참여하게 되었다. http://www.penguinol.com/wp-content/uploads/2017/09/logo.png 0 0 pol http://www.penguinol.com/wp-content/uploads/2017/09/logo.png pol2015-10-26 12:00:002017-12-04 20:41:50현대자동차 오토캠핑 서킷 페스티벌에 참여하다!! (주)POL, (주)EPG가 참여한 카약체험교실이 7월 18일(토) ~ 7월 24일(금)에 여의도 한강시민공원에서 열린다. – 카약체험교실 참가 후 응모권 작성하여 응모함.